HOMEOPATHY IS SAFE, EFFECTIVE, & LOW-PRICED. All ages can safely use and benefit from homeopathy. Homeopathy can be safely taken with over-the-counter drugs or prescription medications. Homeopathy works on a different, more subtle cellular level in the body and does not interact with other medications or therapies. Many people will use homeopathy to offset prescription side effects and augment benefits. There are no contraindications to the use of homeopathy. As always, if you are under a doctor's care, ask when you can use complementary and alternative medicine (CAM) such as homeopathy. Homeopathy should be an important part of your health plan that includes additional health modalities and health therapies. Homeopathy can be safely used with herbs and supplements. Conventional medicines when combined with other medicines cause side effects and serious to life threatening results. Homeopathy is without side effects. How is that possible? Because Homeopathy is based on Provings and the Homeopathic Law of Similars. This is in contrast to conventional drugs that are selected because of their chemical or suppressive action in a human body. All conventional medications have side effects on the body because they are forcing the body to act a certain way. Homeopathic Law of Similars is based on certain characteristic symptoms being the key to choosing a remedy. A substance which may in a large dose cause undesirable symptoms, can in homeopathic potency repel these similar symptoms out of your system and the body rebalances and heals. In homeopathy the Law of Potentization is using the magic of the mininum, that is the smallest dose needed. By extreme dilution and Homeopathic potentization, curative properties are enhanced and poisonous and undesirable side effects ameliorated. Doctors, dentists and homeopaths may include homeopathic remedies with their practice to lessen infection risk and speed healing. Pregnant women can use homeopathy to help with pregnancy and labor when other medications are risky. Homeopathy is a safe and natural method to repel imbalance out of the body and allow the body to heal. Homeopathy stimulates the body's ability to heal with very small amounts of natural substances. and the rapidity of healing. Homeopathy is from 2 Greek words, homoios: meaning similar and pathos: meaning suffering. Homeopathy therefore means similar cures similar or like cures like. The word Homeopathy was first coined by Samuel Hahnemann, the founder of modern homeopathy. Homeopathy has distinct differences from conventional medicine. Conventional medicine is also called allopathic medicine or use of opposing substances to suppress symptoms in the body. Homeopathy though works with the body's natural defenses. The amount of a homeopathic medicine needed is incredibly small, yet enables the body to rebalance in a short amount of time. Homeopathic products are under the same regulations as allopathic drugs. Homeopathic products are considered by the FDA as over-the-counter drugs with legal status and can be sold without a doctor's prescription. Homeopathics Are Regulated By the FDA. Every homeopathic product bears a National Drug Code number, ensuring the consumer that the product has been made in concordance to The Homeopathic Pharmacopeia of the U.S. Homeopathic medicines are prepared and marketed in accordance with FDA Compliance Policy Guide No. 7132.15. Manufacturers of homeopathic medicines are registered with the FDA and licensed by state regulatory agencies. We can legally tell you the benefits and indications of homeopathic remedies. How did Homeopathy Get its Name? From the Greek words-homoios, meaning similar, and pathos, meaning suffering. Definition is like cures like. Ingredients- What is in a Homeopathic Remedy? What are the Remedies Derived From? Homeopathy uses natural products -- usually plant or mineral substances. originial substance. Homeopathic remedies are therefore non-poisonous. Safe for all ages. Healing properties are enhanced with homeopathic preparation of dilution and succussion. How does my Homeopathic Remedy Work? Your remedy works with your body based on 3 principles or laws used in homeopathy: Law of Similars is based on certain characteristic symptoms being the key to choosing a remedy. A substance, which may in a large dose cause undesirable symptoms, can in homeopathic potency repel these similar symptoms out of your system and the body rebalances and heals. Law of Potentization is sometimes called the magic of the minimum dose; homeopathy uses the smallest dose needed to get the body response. By extreme dilution and Homeopathic potentization, curative properties are enhanced and poisonous and undesirable side effects removed. Holistic Principle is that the remedy or combination is chosen to treat the person symptoms considering the person's specific needs. Is There A Homeopathic Remedy That Will Help My Entire System? Yes! It's Bioplasma, a combination of the 12 basic minerals used within our cells. boost the immune system, and keep your physical performance at its best. See online SALES. Kathryn Jones DiHom M. Ed. Health Counselor, feels the Cell Salts are the best way to become introduced to Homeopathy. Indepth information on each individual Cell Salt, listing deficiency signs, health indications and more. Cell Salts can be used with other homeopathic remedies and therapies to speed healing. SAFE alternative to other therapies. A) Homeopathy is safe in being a non-invasive therapy and being non-toxic to the body. The safety of homeopathy, by offering no long term side effects, is well known. Homeopathy also boasts of being safe for pregnant women, infants and the elderly as compared with other therapies. rendering them non-allergenic and non-poisonous. Goto Principles and Laws of Homeopathy for how homeopathy works. Rather than cure by suppression, homeopathy stimulates the body towards balance. Homeopathy uses natural substances, not synthetic or chemical. C) Homeopathic Medicines are recognized and regulated by the FDA. Homeopathics have OTC status, that is over-the-counter status. Most remedies are available without a prescription. Bottles have labels listing basic indications for that product. D) Expense is also a reason for homeopathy's success. and $7.99 for single remedies 250 tablets. therapies and medications. Homeopathy can be used along with supplements and herbs. Homeopathy can be safely taken with heart, blood pressure, insulin, thyroid, and other other medications. F) Chronic diseases can be treated with homeopathy. Homeopathy is known best as a first aid remedy for quick help for sudden, acute, and seasonal illnesses. Homeopathy also offers deeper healing for those with long term diseases and health problems. G) Variety of remedies and products is unsurpassed with Homeopathy. Homeopathy offers products for specific and general allergies. Remedies for women's health concerns whether fertility, pregnancy, labor, menstrual, menopausal. Remedies for infants, children, and teens- for physical and emotional disorders. Because homeopathy treats symptoms, it is not limited to the type or number of diseases it can treat. Nor is it limited to whether the problem is physical, mental, emotional or a combination. The best place to start is with Homeopathy is Biochemic Minerals, called Cell Salts. I Hate Swallowing Pills. Is Homeopathy An Alternative? systems. 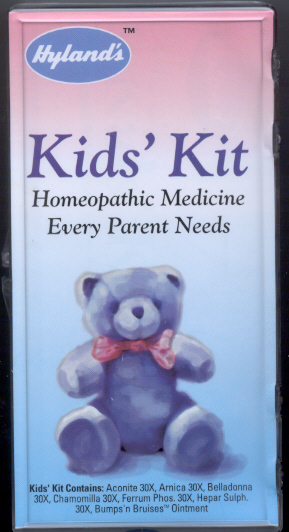 Children also love homeopathics, with no large capsules to swallow or bad tasting liquids. Homeopathic remedies usually have no taste, or if there is a taste, it is mild and sweet. Homeopathic Kits come with information. using homeopathy convenient and easy. First-aid for any injury, pain, trauma, shock, sprains & fractures. Arnica is included in the Kid's Kit, the Family Kit and the Household Kit. Having basic remedies or a kit on hand will enable you to respond quickly. longer wait until the illness has progressed 2 or 3 weeks to seek medical help. Is Homeopathy a Viable Medical Treatment? Homeopathy is no longer thought of as on the fringe of alternative medicine. Homeopathy is on equal par with allopathic, or conventional medicine, in England, France, Germany, and India among other countries. In the U.S., we are seeing renewed interest in homeopathy along with other complementary alternative medicines / CAM. hospitals. Scientific understanding of how Homeopathy works is increasing. verify that homeopathics do indeed carry a vibration with them. in the body. Once the imbalance is thrown out, the body can heal itself. In the U.S. over 1000 M.D. 's and N.D.'s specialize in homeopathy. Many other health professionals use homeopathy in their practice. Homeopathic remedies are legal in the U.S. and many countries throughout the world. The FDA, since 1938, has regulated the manufacture of homeopathic remedies. Remedies are manufactured according to the Homeopathic Pharmacopeia of the U.S.
and we can legally tell you online the benefits of a homeopathic substance. Do you have an illness or health problem that has plagued you for years? Do you not have as much energy as you would like? Are you sick and tired of pharmaceutical drugs and all their side effects? "science of poisons" or that there is no pharmaceutical drug without side effects? eventually be healed without all the side effects of pharmaceutical drugs? Principles and Laws of Homeopathy page for how homeopathy works. Medica Page for our on-line Materia Medica. 29 remedies are set out in a condensed Provings format. There are many Materia Medicas (some a 1000 page each) used by Homeopaths today. The remedy name is followed by Proving symptoms. The categories are similar in each, starting with mind symptoms, head, face, and down to the various system in the body, the extremities, etc. The descriptive way to write the symptoms are called "Rubrics". These Rubrics are also listed in same similar order in repertories. Studying Homeopathy and Homeopathic Remedies can be a life long pursuit for Homeopaths. With a current interest in natural, no side effect healing many new Homeopathic books are on the market. These books offer in layman's terms the information from Materia Medicas and Repertories. These books also give general health care information. Homeopathy offers a safe and effective alternative to medications with dangerous side effects. Homeopathics can balance both excess and deficiencies. Homeopathic Glandulars, such as Thyroid Support, work to balance and support your thyroid gland.